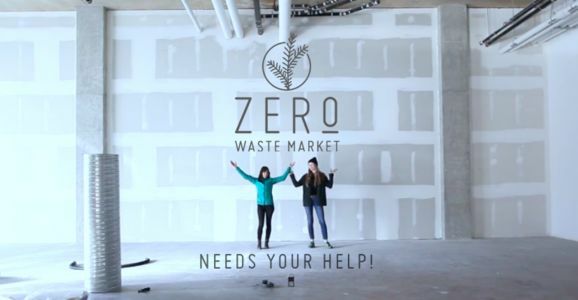 Help Zero Waste Market secure their commercial lease in Vancouver, B.C.! Zero Waste Market is the first zero waste grocery initiative in Canada, incorporated in the Spring of 2015. We are on a mission to cultivate a better world by inspiring people to change the way they shop for groceries, and we envision a lighter world that values a food system free of excess and waste to support the health of both people and planet. Over these past two years, we have hosted pop-up shops at the Patagonia store in Vancouver. We have brought you package-free foods, zero waste starter items, and imperfect local & organic produce in an effort to support and strengthen our local food system. But most importantly, we have witnessed an incredible community of folks come together to support us along each step of the way by coming to every one of our events, promoting us on social platforms, and talking praise via word of mouth. We seem to have filled a gap in the city that we had only hoped existed and we are so excited to continue to see the zero waste movement grow! This is where we need your help! For the past six months, we have been in lease negotiations for a commercial retail space in a City of Vancouver-owned building. When it comes to commercial real estate, there is a lack of prioritization for green businesses, let alone those that are tackling all of the Greenest City 2020 Action plan goals, Vancouver Food Strategy, and upcoming 2040 Zero Waste Strategy - as we have been doing from the get-go. We have hit a wall and are in need of a final push to convince the Real Estate Department to support our start-up & our mission of reducing food waste and plastic pollution. We have created this petition to include in our final proposal as proof that Vancouverites are demanding a store like ours and that they are willing to shop at a package-free grocer. What makes us so awesome & deserving of this space? - The obvious: we are fighting food waste and plastic pollution by offering 100% package-free items, and are working hard to implement circular economy practices throughout our supply chain. - We supply food & products from over 125 local businesses, all of whom we have influenced to adapt their operations to reduce waste not only in our business, but in theirs as well. - We are strongly supported by the Vancouver social innovation scene, having participated in business accelerators designed for impact-based businesses such as RADIUS, Spring, and UBC's Innovation Hub. From these, we have pulled together an incredible advisory board with decades of experience in the grocery industry to help us pull this off! - Community is at our core: we currently donate 1% of proceeds to local non-profits tackling food waste, food education, and marine conservation initiatives. Our donations are also topped up nearly ten-fold by fundraising events that we continue to organize, and we're on track to become a 1% For The Planet member and the country's first Certified B Corp grocery store. - We have worked closely with many City of Vancouver departments to support the goals of the city: we've run joint pop-up city halls with their community outreach & zero waste teams, we were an invited speaker & participant at the 2040 Zero Waste Strategy workshops, and we have been featured at Metro Vancouver's Zero Waste Conference. With all of this in mind, let us come together and encourage the Real Estate Department to prioritize our green business so that we can have our dream home and bring you a retail store once and for all! We are tackling some of the biggest issues our city is facing alongside many other incredible businesses, and we look forward to cultivating healthy and conscious communities for many years to come. Thank you so much for your ongoing support everyone! We would really appreciate it if you could share this far and wide through your networks. The City of Vancouver’s Greenest City 2020 Action Plan, the Vancouver Food Strategy, and the upcoming 2040 Zero Waste Strategy are proof of the city’s recognition and support of a just and sustainable food system. I am proud that the city in which I reside is setting the bar high when it comes to green initiatives and that we are setting the precedent for other cities to follow suit. With this in mind, please consider this letter a token of my support for Zero Waste Market in their application to lease 691 East Broadway, Vancouver, BC. Zero Waste Market is Canada’s first zero waste grocery initiative, created and brought into fruition in the Spring of 2015. They are on a mission to cultivate a better world by inspiring people to change the way they shop for groceries, and envision a lighter world that values a food system free of excess and waste to support the health of both people and planet. Zero Waste Market has proven their business model via pop-up shops where they offer package-free foods, zero waste starter items, and local & organic ‘imperfect’ produce, while educating the community about circular economy principles. Their mission and operations align with all of the goals encompassed in the Greenest City 2020 Action Plan and the Vancouver Food Strategy, acting as an example for other green initiatives. Most importantly, they have facilitated the growth of a large community passionate about waste reduction and a sustainable local food system, which will have far reaching effects in terms of the city's zero waste and food strategy goals. I kindly request that the City of Vancouver’s Real Estate Services department prioritize green businesses, including Zero Waste Market, for city-owned commercial real estate to create more vibrant and resilient communities. These local businesses are tackling some of the biggest issues our city is facing, and will help develop healthy and conscious communities for many years to come.